Created, Hosted and Produced by Paul Brown and Steve Barnes. #DRONESTORY is available now for reality television consideration. #DroneStory delivers a revolutionary new perspective on some of the most interesting historical locations in the world. #DroneStory will focus on interesting history and polarizing pop culture in 30 minute episodes that shed a whole new light on famous and infamous locations all over the world. Paul and Steve are going to merge their two great passions, History and Technology and show you where they intersect. History takes flight with all new perspective and interest. #DroneStory will have an aggressive social media component leveraging both Paul’s and Barnes’ robust social following of over 50,000. Pertinent hashtags will also drive engagement and amplification. #DroneStory will leverage SnapChat, Twitter, Instagram, Facebook, and YouTube with exclusive behind the scenes drone footage and special behind the scenes action. One thing is clear…when you see a drone in the wild people can’t stop looking at it or watching it. #DroneStory capitalizes on this phenomenon using a drone as character in the show. Viewers will not only see the drone in action but also see history and pop culture through the eyes of the drone. Images during the show will be images never before seen on television uncovering intriguing facts about precarious destinations all over the world. The demographic reach is far and wide for this mesmerizing television concept and fueled by social media will be a word-of-mouth juggernaut in reality tv. 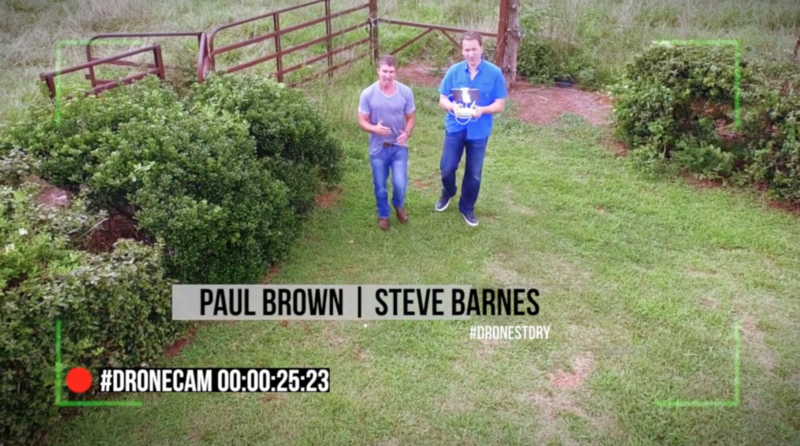 As host of Endless Yard Sale and Auction Kings, Paul Brown brought his passion for the past to millions of viewers through Object history, and now, with help from Steve, and his advanced, cutting edge drone technology, we are going to bring you the concept of Place History with #DRONESTORY. There exists an opportunity to market this show not only to the coveted 18-49 market, but also to the children’s TV market. We could take the same show, give the drone a name (Indiana drones) and give it a personality and, voila, we’ve got Blue’s Clues for the 22nd century. This sizzle reel is simply the tip of the iceberg with regard to the fascinating and histories stories we could produce. Contact us for more information.